Credit card payments can be frightening, particularly for consumers who do not have strong mathematical skills but see their balances continue to climb after writing regular checks to their credit card company. Understanding the details about paying a balance, however, can help demystify these monthly numbers. Every credit card statement has two critical numbers prominently featured on the detachable slip: the total balance and the minimum due. While the best course of action is to pay the entire balance (thereby avoiding interest fees and debt accumulation), many people who are strapped for cash opt to pay the minimum instead. Unfortunately, this can lead to an increasing cycle of debt that could take decades to pay off once monthly interest is compounded on the remaining balance as well as any new charges. In general, the required minimum is between 2 and 4 percent of the total balance. In the past two years, most credit card companies have raised their minimums in an attempt to help consumers pay down debt more quickly - a larger minimum not only takes care of accumulated interest and fees, but also helps reduce the balance, which will reduce the interest burden the next month. The more a cardholder can pay above the minimum, the faster their debt will disappear, potentially saving thousands of dollars in accumulated interest. To calculate a minimum due and how a larger sum will affect the overall balance over time, try Bankrate.com's calculator. Unfortunately, consumers are also subject to fees that increase their balances even if they pay above the required minimum. Late fees are the most common and can be not only flat rate penalties, but also increased interest rates until the cardholder demonstrates reliability through a series of timely payoffs. Other fees may include added charges for paying the bill on the day it is due (the issuing bank may add a "rush" surcharge even without a late penalty) and fees for going over the established credit limit. 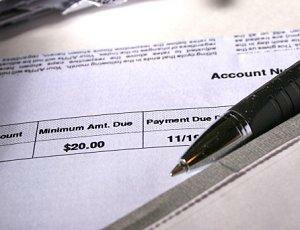 The easiest way to control payments is to avoid paying the bill late. Most banks and credit card companies offer email alerts to let cardholders know when the statement is ready, and interactive websites offer continuous access to updated account numbers, including due dates and when transactions are processed. When sending a check through the mail, it is best to drop it in the mail box at least a week before the due date to account for postal and processing delays, and always include the original detachable portion of the bill and write the appropriate account number on the check to expedite processing. Paying online can circumvent the postal service altogether. Some credit cards offer insurance protection for monthly statements. This insurance - paid in annual or monthly premiums - is designed to cover regular balances if the cardholder is unable to pay because of medical or unemployment problems, but for most consumers this type of protection is unnecessary and may even cause more problems if it raises the card's annual percentage rate (APR). By carefully regulating spending and setting aside enough to pay the bill each month, consumers can easily protect themselves without having to pay for additional insurance. If managing high balances is a problem, there are several ways to lower monthly payments without damaging a credit rating. Avoid new charges by using cash instead of credit. Pay as much additional principal as possible to lower interest charges. Call the card company to negotiate a lower interest rate. If these minor interventions are not enough, consider speaking with a credit counselor for more drastic measures and debt management advice. Credit card payments are a monthly inconvenience, but they do not have to be a financial hazard. By paying the bill in a consistent, timely manner and exceeding the required minimum, it is possible to lower balances easily and successfully manage your credit.